Speed crazy thrills as wild youth tear up the streets! Crazy kids living to a rock and roll beat! Sounds like just another day in THE DARK VAULT OF PUBLIC DOMAIN. But it’s more this week! Join UNCLE PETE as he and some of the gang take a road trip and bring you the asphalt meltin’, engine revvin’ feature – Hot Rod Girl! Seems there’s been a bunch of illegal drag racing going on in the streets and Detective Ben Merrill (Chuck Connors) and one of the town’s top drivers and mechanics, Jeff Northrup (John Smith) are doing something about it. They set up a for real drag strip where those speed crazy kids can do some racing in a little safer setting (at least when the wreck, it won’t be on somebody’s front lawn). It’s working just fine, and the top dragger just happens to be Lisa Vernon (Lori Nelson) – Jeff’s girl – in her T-Bird! But when Jeff’s younger brother gets goaded into a street race and killed to boot (on somebody’s front lawn), Jeff quits the scene for good. That is until an out of town JD by the name of Bronc shows up in his high powered mill. He’s causing trouble at all the cool hang outs, but when he starts bugging Lisa, Jeff gets sucked into a street race and a kid on a bike gets croaked. And the evidence points to Jeff. It’s up to Lisa, Detective Ben, and the gang to help Jeff straighten out this mess and set Bronc straight. 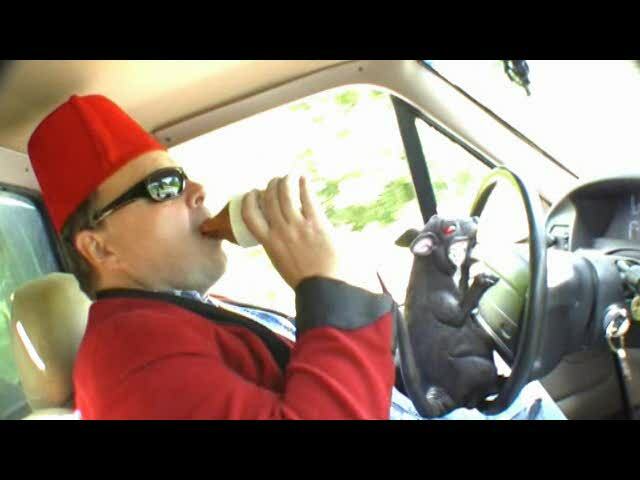 Back on the road, it’s UNCLE PETE and Max and Stone Dog cruising in Mobile Vault One. What with the Vault exploding and all, it seemed like a good time to take a road trip back up to Lake Dark Vault. And UNCLE PETE runs into (and over) a plethora of interesting characters on the way. 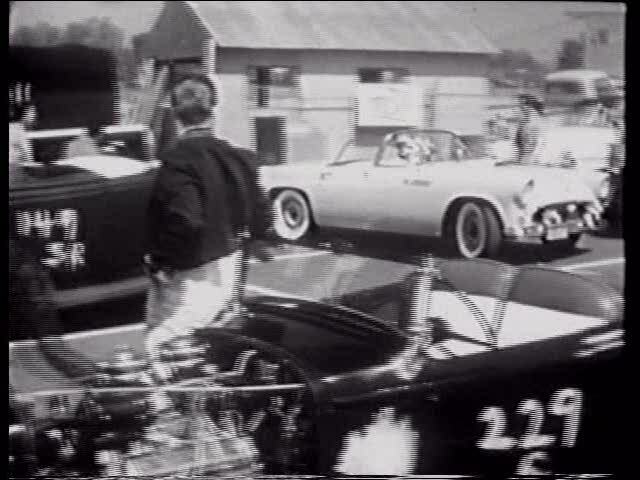 He also finds time to bring you some music (Jody Miller singing Things), a spot about the brand new 1956 Ford Thunderbird, a James Dean safe driving public service announcement, and a Chevrolet sponsored short about preparing for a trip entitled How To Go Places starring Gail Storm. It’s Hot Roddin, Road Trippin’ fun this week with Hot Rod Girl, Saturday, September 29, 2012 at 10PM to midnight on channel 4. 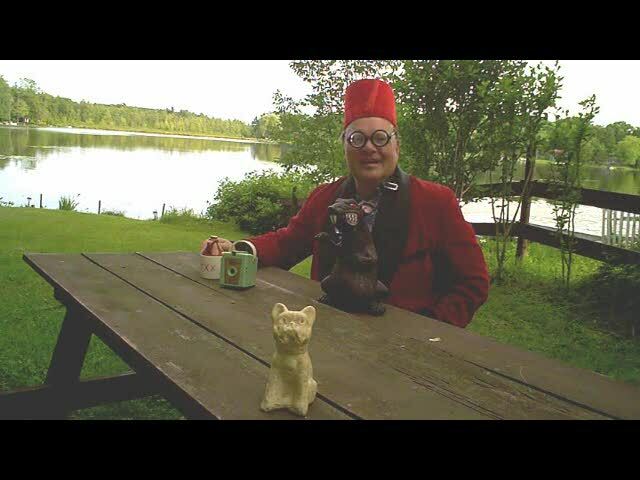 So join UNCLE PETE (and bring your oboe) for the next DARK VAULT OF PUBLIC DOMAIN! ~ by UNCLE PETE on September 29, 2012.